Let it now be said that when it comes to recruiting and reeling in decorated high school prospects, Lane Kiffin knows what he’s doing. There have been a number of criticisms directed toward the Trojans’ 36-year-old coach in recent years, but just about anyone, including his detractors, will concede the following: he can recruit with the best of them. Recent seasons only prove testament to that notion. Last February, 30 players signed with USC despite the fact that there would be no possibility of participating in a bowl game in their first season on campus. The class, nonetheless, was ranked No. 4 overall in the country by Yahoo Sports’ Rivals.com. In 2010, the Trojans signed 20 commits -— the No. 1 class, according to Rivals.com. Perhaps even more impressive was that Kiffin and his staff had arrived at USC less than a month before national signing day and retained many of the same players who had originally committed to play for then-coach Pete Carroll. 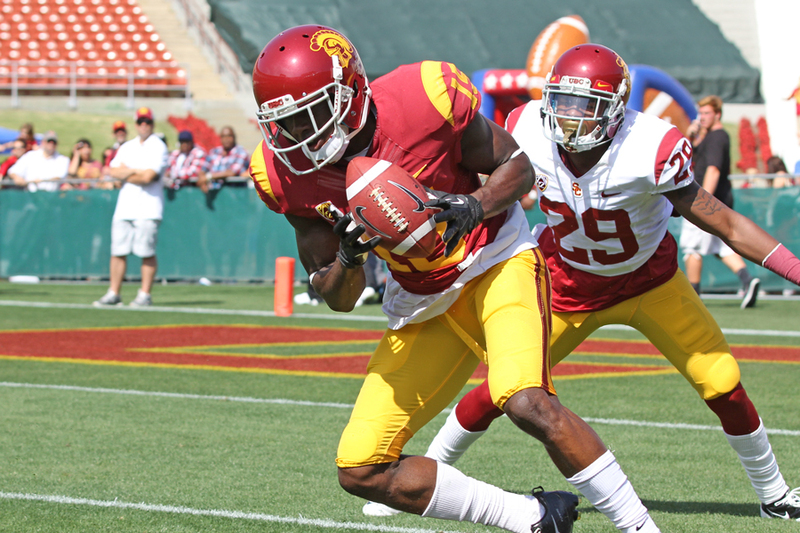 But this season might prove to be the toughest test for the Trojans’ heralded staff. And yes, you can of course attribute that to scholarship reductions, stemming from NCAA sanctions. This winter, roster management will become increasingly important for the program, and precision will be more necessary than ever. As outlined by the infractions report from June 2010, USC cannot sign more than 15 players for the class of 2012, excluding early enrollees who count toward the 2011 class. And by next fall, it can carry no more than 75 scholarship players on its roster. How the staff handles that remains a delicate balance. With national signing day on Wednesday, USC still intends to sign a full class, which in this case happens to be 15 as opposed to the typical 25 for fall enrollees. But bringing in 15 freshmen next August is more complicated than simply receiving faxed and signed letters of intent. 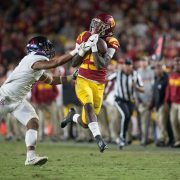 For starters, USC currently has 66 scholarship players on its roster — excluding senior cornerback T.J. Bryant and sophomore safety Patrick Hall who have reportedly left the program, and senior defensive end Armond Armstead, who is unlikely to be cleared by the school’s medical staff. Armstead is expected to either transfer to another school for his senior season or declare for the NFL’s supplemental draft in the summer. That means in order to sign 15, six players need to go before fall camp. How that will happen remains to be seen. One method is for Kiffin and his staff to take away players’ scholarships, which are renewable annually. In that case, former walk-ons, junior linebacker Will Andrew, senior cornerback Tony Burnett and senior center Abe Markowitz, could all see their scholarships revoked. Another option to dwindle down to 75 would be for players to transfer, presumably players low enough on the depth chart. Who leaves, though, remains unknown. Rumors have circulated for weeks that sophomore quarterback Jesse Scroggins could be a likely candidate. The Lakewood, Calif., native was not at the team’s unofficial throwing session last Thursday. Though, Scroggins’ status with the program remains — to some degree — speculative at this point. But the toughest part largely centers around who USC will sign. With fewer and fewer scholarship offerings, USC can’t afford to miss on highly regarded prospects. And don’t think Kiffin, in spite of his recruiting pedigree, hasn’t missed before. Two years ago, USC signed a total of five five-star prospects: wide receiver Markeith Ambles, running back Dillon Baxter, offensive tackle Seantrel Henderson, wide receiver Kyle Prater and wide receiver Robert Woods. Since then, Ambles left the program, Baxter transferred to San Diego State, Henderson was released from his letter of intent and never played a down at USC and Prater transferred to Northwestern. It is probably worth noting at this point, and fair to point out, Woods turned out OK. But the point remains: Recruiting is an inexact science, at best. When typically signing classes around 25 players per year, there is added flexibility. If one running back happens to leave, that’s fine as there are two or three more in that particular class. That luxury, however, isn’t afforded to USC. It can’t afford to miss. It can’t afford to sign a player who is not able to stay academically eligible. It can’t afford to sign a player who doesn’t develop, either. There is little room for error this time around — even for Lane Kiffin. “The 19th Hole” runs Mondays. 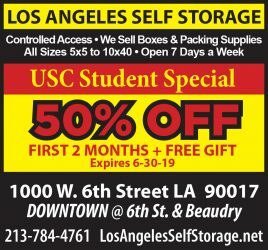 If you would like to comment on this story, visit dailytrojan.com or email Joey at jrkaufma@usc.edu.